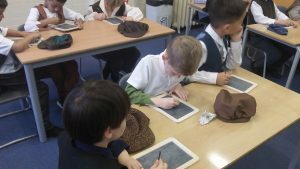 Next week: After the Easter break the children will write a limerick poem on Van Gogh. 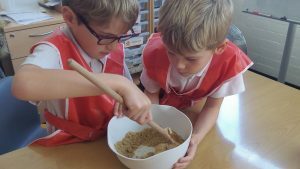 This week: The children have developed their understanding of measurement. 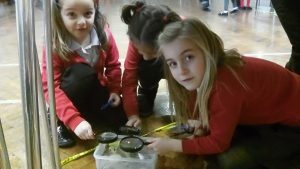 They have explored different units of measure when looking at length, capacity and weight. 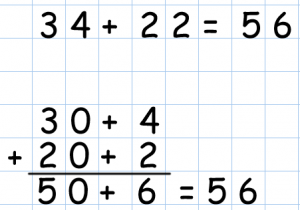 Next Week: After Easter the children will be revising place value. 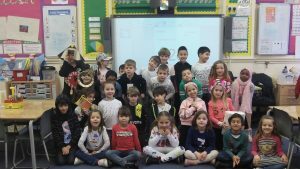 Enjoy your 2 weeks off! 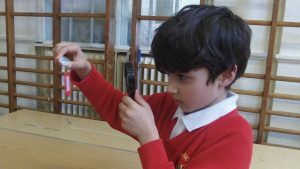 Making amounts using different coins- 20p= 10p+10p 20p=5p+5p+5p+5p. 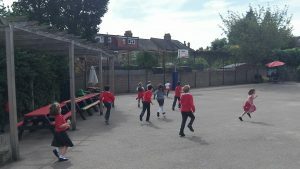 Can you beat Ms Kyprianou’s score of 21? Good luck! 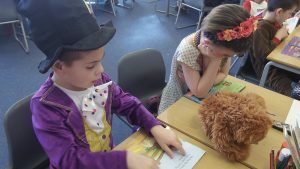 Carry on practising your times table rock stars and try to beat your scores! 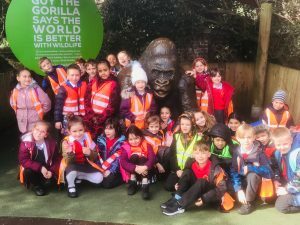 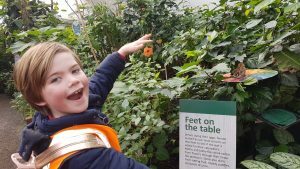 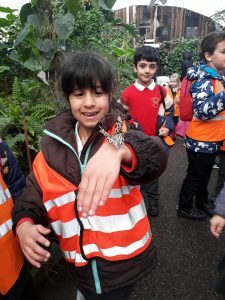 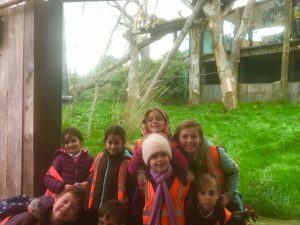 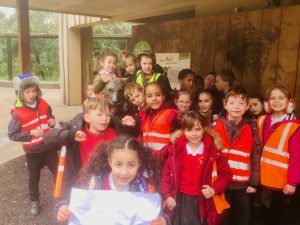 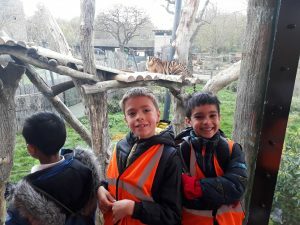 We had a fantastic time at London Zoo. 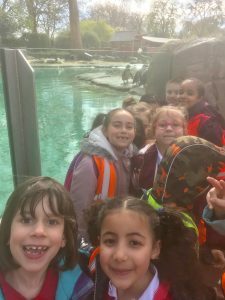 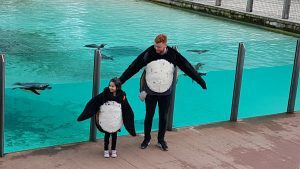 We saw lots of different animals and we even got to see Mr Williams dressed as a penguin! 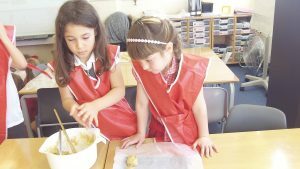 During Science week the children had had a full week of investigations and science theories. 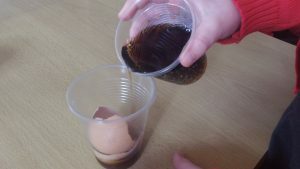 They investigated tooth decay using different liquids and egg shells. 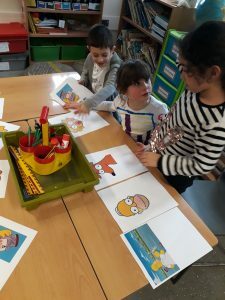 The children discussed the importance of a fair test and predicted the results of the experiment. 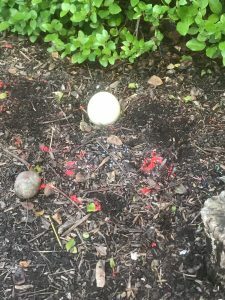 A crime had taken place in Rowan Hall! 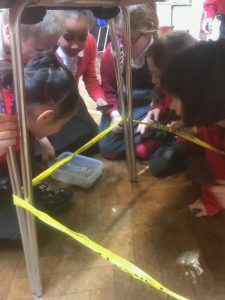 The children had to use their detective skills to solve who the culprit was. 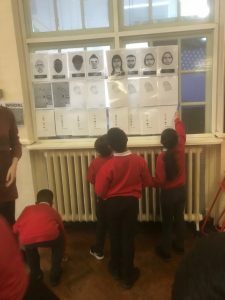 They looked at finger prints, foot prints and DNA. 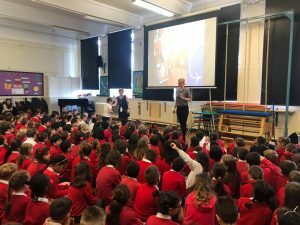 We were lucky enough to have parents speakers come in and discuss their exciting careers. 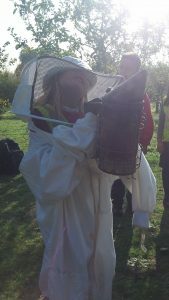 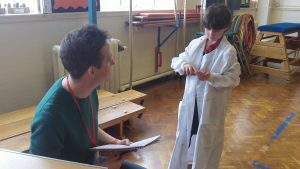 It has made a few children in year 2 want to become scientists when they are older! 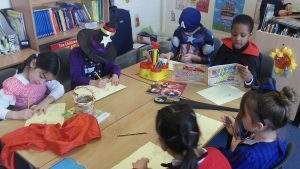 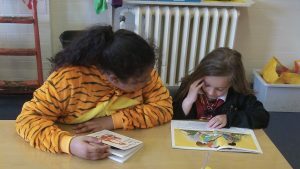 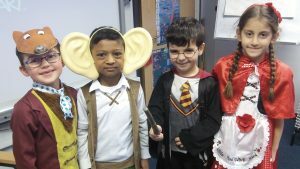 Year 2 had a fantastic, jam packed World Book Day! 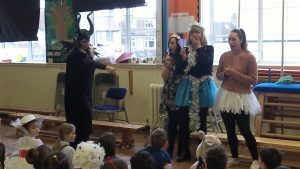 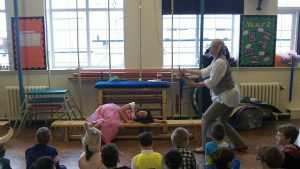 We started off with a ‘Sleeping Beauty’ show performed by the year 2 teachers. 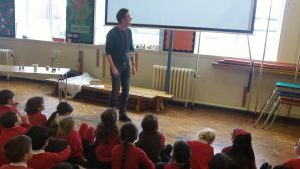 The children also had the opportunity to listen a published author read a snippet of their story and even had a workshop with Amanda Swift. 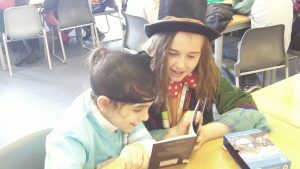 Finally the children paired up with Year 5 and shared their favourite stories! 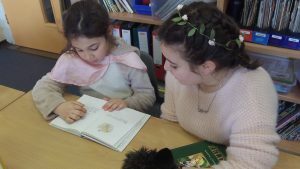 If you will be available to support us at any point this year, please see the office to complete a DBS check as it is not possible for you to accompany us without one. 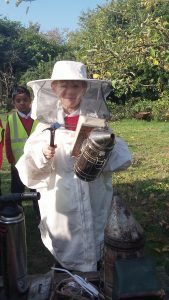 You will also need to do an induction with Mrs Gannon. 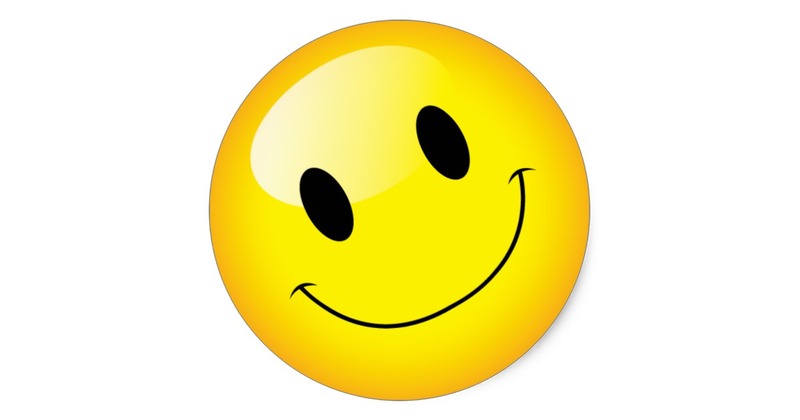 Thank you again for your amazing support. 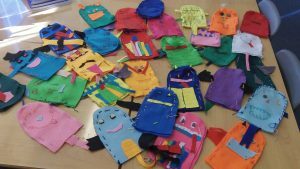 In D&T the children designed and created their own dragon puppets. 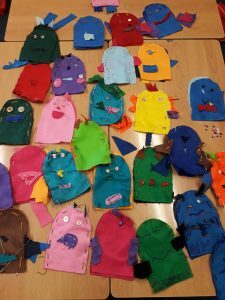 Using the running stitch, the children joined two pieced of felt together and then decorated their dragons using buttons and fabric. 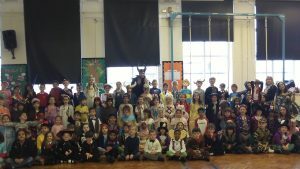 They all looked great! 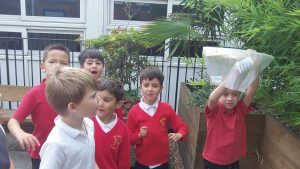 In Science we tested to see which material would keep the popcorn dry. 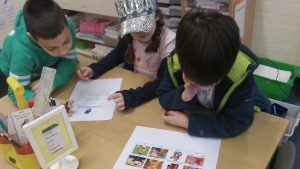 We found that some every day matrials are waterproof (foil) and some materials absorb water (tissue paper). 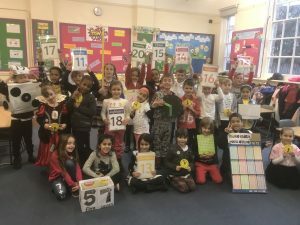 The children looked amazing in their number costumes today! 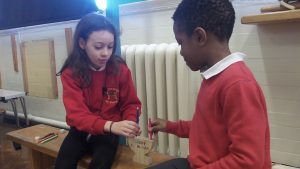 We have had a fun filled day with lots of maths challenges. 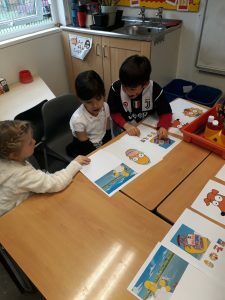 The children worked on their reasoning skills. 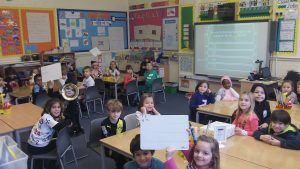 They then answered logic problems and finally took part in a game of Who wants to be a mathionaire? 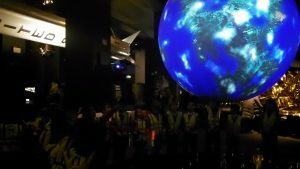 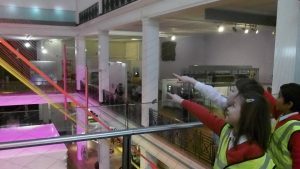 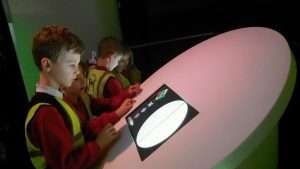 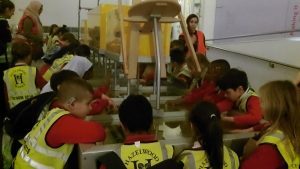 We had a fantastic time at the Science Museum on Thursday. 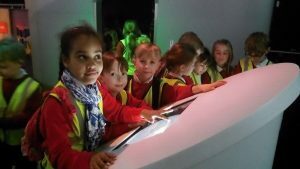 We were able to explore lots of different and exciting things including the materials section and the pattern pod. 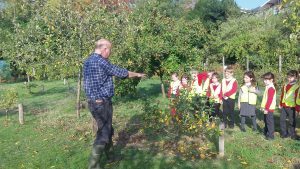 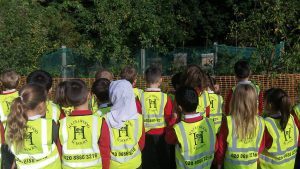 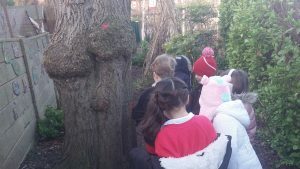 This week we heard news of rustling noises in the wildlife garden so we went investigate. 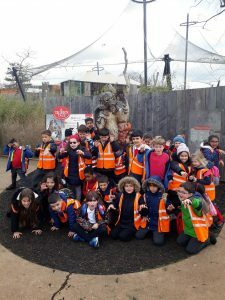 On our way we saw crimson blood and shiny scales scattered on the floor. 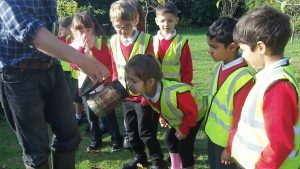 We eventually found a mysterious and delicate dragon egg hidden under some leaves!! 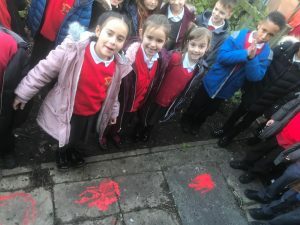 Could dragons be coming to Hazelwood? 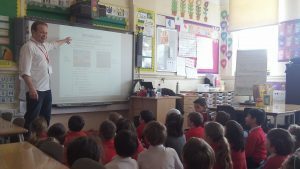 The children had a special assembly on Judaism. 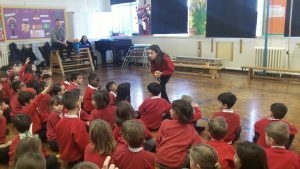 Leah from year 4 told us the story of Hannukah and showed us lots of different objects used for this festival. 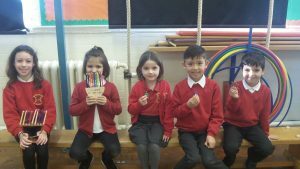 The children then answered questions and made their own dreidels. 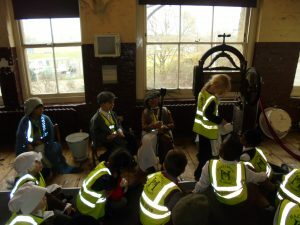 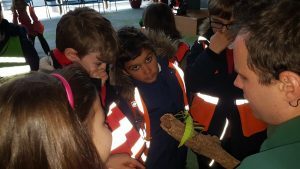 We had a fantastic time at the Ragged School. 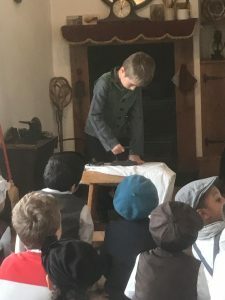 All the children were dressed up as Victorians and explored what life would be like for children in the past. 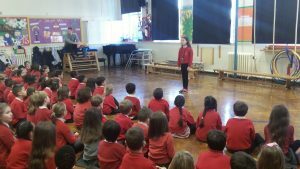 The first workshop was about a girl called Polly. 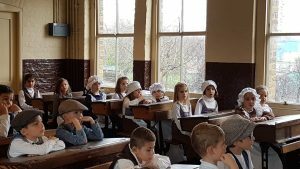 We listened to her story and learnt how tough life was for Victorian children. 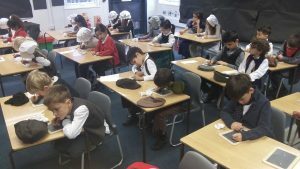 We time travelled back to 1888 for our second workshop. 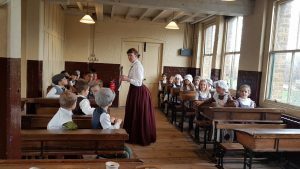 We experienced a glimpse of Victorian life in a school. 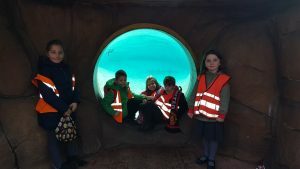 Our Big Bang was fantastic! 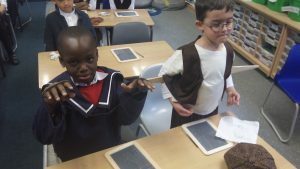 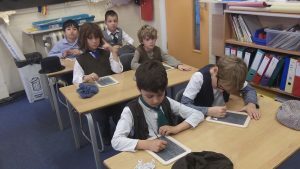 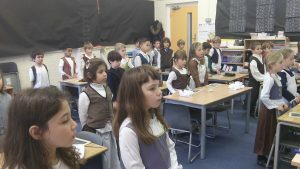 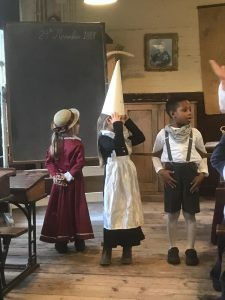 The children came into school dressed as Victorian children and experienced a typical day in the life of a Victorian child. 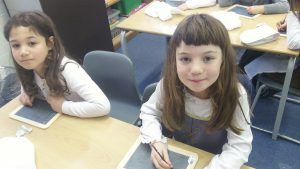 The children worked on the 3 R’s – reading, writing and arithmetic. 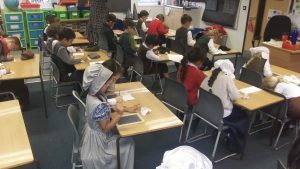 The children sat in rows and did all their work on chalk boards. 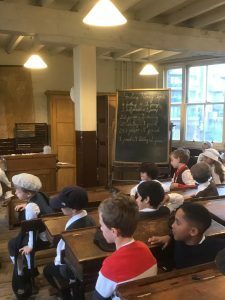 We had a great day but have decided Modern day schools are much better than Victorian schools! 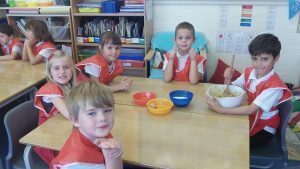 The children made delicious cookies with raisins, sprinkles and golden decorations. 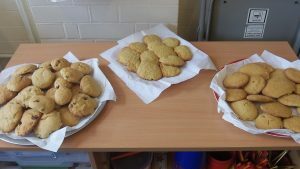 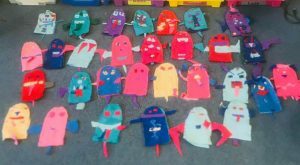 We had so much fun making them for our cookie sale and have managed to raise £63 for ‘Friends of Broomfield Park’! 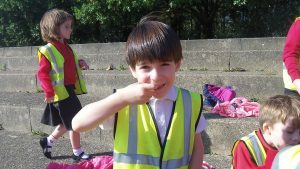 Thank you to everyone who bought a cookie- they were all gone in just 10 minutes!